Single Girl Gourmet: A foodie, but a seafoodie? Making seafood automatically impresses people. There are so many different kinds of fish whereas beef is pretty much beef and chicken is chicken! But don't be intimidated by the variety, making seafood is so easy. Plus it's healthy (lean protein, low calorie, Omega 3s) and quick. I'm a Midwestern girl but I've always loved seafood and now that I'm living near the coast I'm taking advantage. This week, I made flounder for the first time and it was absolutely delicious. It was an old family recipe...do you believe that BS? I'm from the Midwest! The recipe is one they were giving out at the seafood counter. I pared the recipe down a little to make it more single girl appropriate and it says to use flounder but you should be able to use any flaky, white fish (tilapia, halibut, bluefish - I think any would work). Place small amount of olive oil or butter in a medium skillet on medium heat. Place flour and egg each in shallow bowls. 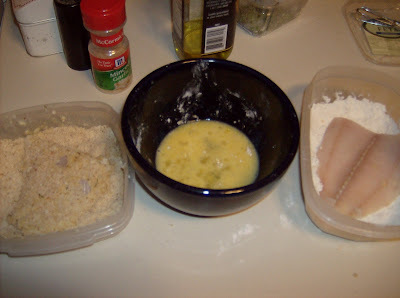 Mix bread crumbs and Parmesan cheese together in a third shallow bowl. Coat fillets in flour, dip in egg and then coat in the bread crumb-cheese mixture. Place in skillet and cook approx 6 minutes, turning halfway through. Be careful not to overcook the fish, they really only take a few minutes. I actually singed the last fillet a bit because I was trying to take a picture of the finished plated product. Oops. This was the first time I made this dish and it turned out fabulously. Very light. 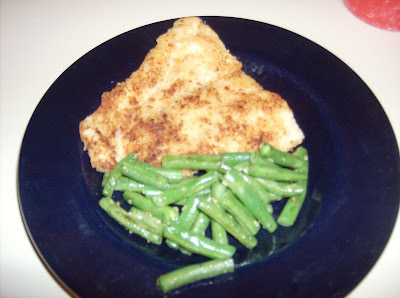 Definitely going to be making this again possibly with tilapia or mahi mahi. Don't tell anyone how easy it was, let 'em be fooled!